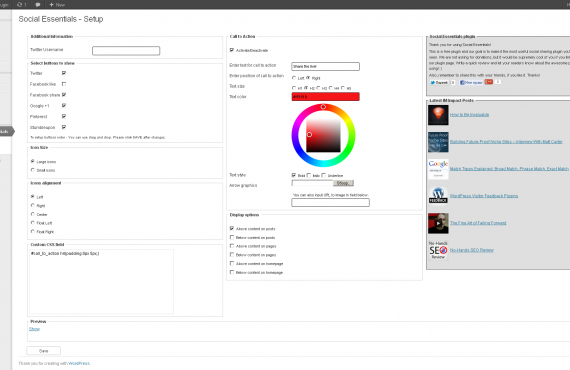 We've developed a plugin for the use of our clients at their website. 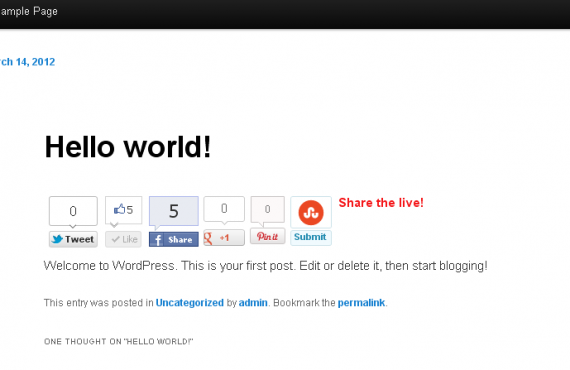 Plugin creates social sharing icons for WordPress websites. The goal is not to support every possible social network but on the contrary to focus on the essentials only: facebook like, facebook share, Twitter, Google+, Stumbleupon and Pinterest. 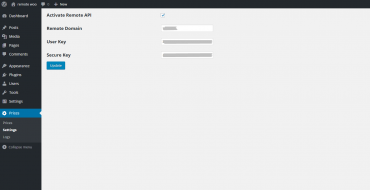 The plugin has options to display large or small buttons at the beginning or end of each post or page on a WP site. We also elaborated documentation on how to use the plugin. It allows you to easily add social sharing buttons to your posts and/or pages. It provides you an overview of your social sharing stats, across all of your posts and pages. Plugins that add social sharing buttons are a dime a dozen, but we've taken things a bit further with Social Essentials. We've created an very easy-to-use interface where you can customize and style your buttons. Change the button order with drag-and-drop, pick small or large icons, automatically insert the icons at the beginning and/or end of your posts, pages and your homepage. In addition, you can easily add a call to action, such as "Share this Post!" next to the icons, to call attention to the buttons and increase your visitors' social engagement. 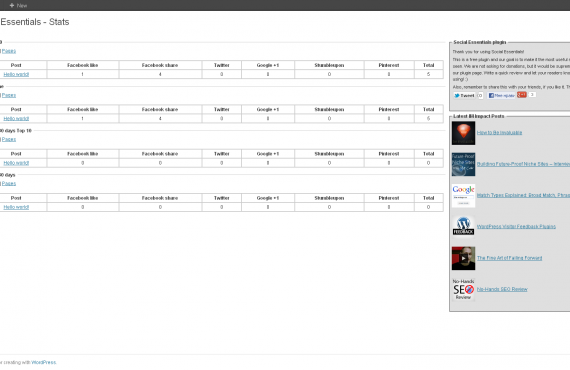 More importantly, with this plugin, you'll get an overview of your social sharing stats. You'll easily be able to see all the sharing stats for facebook, twitter, Google+, StumbleUpon and Pinterest, for each of your most recent posts and pages. Plus, you can see your top most successful posts, ranked by how much they've been shared across all those networks. This will help you determine what kind of content has the most viral potential, on your site and what topics to create more content about.